Hold both sides of the lower end of the pod with your thumb and pointing finger and bring it to your mouth. Press the pod lightly and pop the soybean right into your mouth. Stay Healthy, Enjoy Your Life!! Tasty and Healthy Proper way with nice table manners. There are two ways of eating this style of sushi. One is using your chopsticks, or using your fingers. (1) Mix some wasabi into soy sauce and make paste (comes hot). 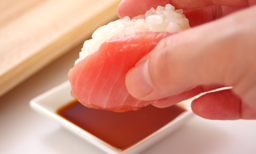 (2) Dip (do not soak) the side or topside of the sushi into the soy sauce and pop it into your mouth. Some sushi have toppings on the rice while others are wrapped inside seaweed. The sushi rice is called “shari” ; the topping “neta” ; the pickled ginger ”gari” ; and the soy sauce “murasaki”. Nice table manner is: No much left the say sauce over when you finish your Sushi. Avoid to use too much soy sauce, and keep nice Sushi flavor.